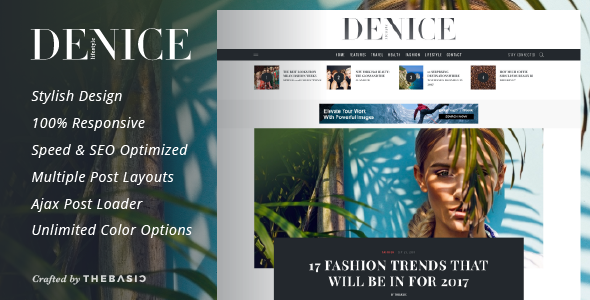 Denice is a minimalist and modern Responsive WordPress theme designed and built for Lifestyle Bloggers & Magazines. Also is a perfect Ad Optimized WordPress theme for Adsense users and Affiliate Marketers to get high earnings through advertisements by increasing the click through rate(CTR). It has so many amazing features that make your audiences want to read more content on your Blog or Magazine. Let your audiences enjoy a smooth reading experience with the clutter free contemporary design of your new website crafted by THEBASIC. Thanks for checking out Denice! If you love “Denice” them please don’t forget to rate us from your downloads page.